The notorious 1987 adventure-comedy Ishtar wasn’t really a labor of love for writer-director Elaine May. Prior to Ishtar, May hadn’t helmed a movie since 1976’s offbeat, poorly performing mob comedy Mikey And Nicky, which stuck her with a reputation as a brilliant mind with an inconsistent work ethic—sometimes driving crews crazy with her perfectionism, and sometimes not showing much interest in the mundane details of filmmaking. But because May had been one half of a groundbreaking sketch-comedy team with award-winning director Mike Nichols in the 1960s, and had done credited and uncredited rewrites on some of the best movie comedies of the 1970s and 1980s, some still believed she was an underutilized talent. And one of those boosters was Warren Beatty, who’d had a hit with the May-polished Heaven Can Wait in 1978, and had the clout to demand that Columbia Pictures give May as much money as she needed to make whatever movie she liked. May came up with an updated version of the Bob Hope/Bing Crosby Road To… pictures, adjusted for the age of terrorism and rock ’n’ roll. Before the project had run its course, the name Ishtar had become synonymous with Hollywood boondoggles. Beatty plays against type in Ishtar—a touch too self-consciously—as aspiring singer-songwriter Lyle Rogers, who has no luck with the ladies or in his career, until he meets Chuck Clarke (Dustin Hoffman), another songsmith with more hustle and enthusiasm than ability. The two men drive their girlfriends away by working all day and all night on their insipid, not-as-profound-as-they-think pop songs, but catch a break when they hire agent Marty Freed (Jack Weston), who makes two suggestions: they should sing songs people already know, and they should take a job playing at a Moroccan hotel frequented by American government officials and their families. (“A lot of acts would kill for a booking in North Africa,” Marty insists.) Within minutes of arriving overseas, Chuck and Lyle encounter left-wing freedom-fighter Shirra Assel (Isabelle Adjani), who uses them to smuggle important information to her comrades in the neighboring nation of Ishtar, much to the consternation of CIA agent Jim Harrison (Charles Grodin), who has friendly relations with that country’s dictatorial emir. Ishtar isn’t just in the tradition of Hope/Crosby; it’s also inspired by Laurel & Hardy, the Three Stooges, and other comedy teams who wreak onscreen havoc when they’re given a job they can’t do by people who don’t know any better. There’s a simple comic idea here: What if Simon & Garfunkel were Abbott & Costello? Chuck and Lyle don’t know anything about global politics. (When Agent Harrison mentions Muammar Gaddafi, Chuck assumes he’s referring to a country.) They aren’t much more savvy about the music business. (At various points in the film, they worry about being humiliated in the press or missing a gig because they’re stuck out in the desert with a stubborn camel; they’re completely oblivious to the fact that no one in the entertainment industry knows or cares who they are.) What they do have going for them is dumb luck and a can-do spirit. At the end of Ishtar, when Shirra starts sobbing at a Rogers & Clarke concert and says, “I think they’re wonderful,” she could be speaking for May, who seems to love these two dopes. Maybe everyone making the movie felt too much affection for the main characters to skewer them properly, and maybe that’s why Ishtar doesn’t have much satirical thrust. May and company gently spoof American interventionism abroad—and the U.S. citizenry’s complete lack of awareness about what’s being done in their name, and to whom—but on the whole, the material about Chuck and Lyle’s misadventures in the Middle East isn’t as sharp or funny as the material about their attempts to become big stars. That may also explain why Ishtar is so misshapen, with a long flashback to the Rogers & Clarke origin story at the beginning, and a long montage of a Rogers & Clarke show at the end. It’s hard to fault May for loading up on the parts of Ishtar that work best, but it does throw the movie out of whack. That said, Chuck Clarke and Lyle Rogers are wonderful. Their eagerness and optimism make them a pleasure to be around, and May writes funny dialogue for them that emphasizes how dim and loveable they are. (When Agent Harrison suggests that Shirra might have seduced Lyle to her cause, Chuck replies that just because she’s a suspected terrorist “doesn’t mean she sleeps around.” When Chuck yells at Lyle’s camel for just sitting there when they need him to move, Lyle says, “Actually, I kind of admire that.”) Paul Williams’ songs in Ishtar are clumsy in the best possible way, expressing two clueless fellows’ idea of “honesty,” and Beatty and Hoffman sing and shape them with an infectious confidence, unwilling to believe they’re making anything other than solid gold hits. 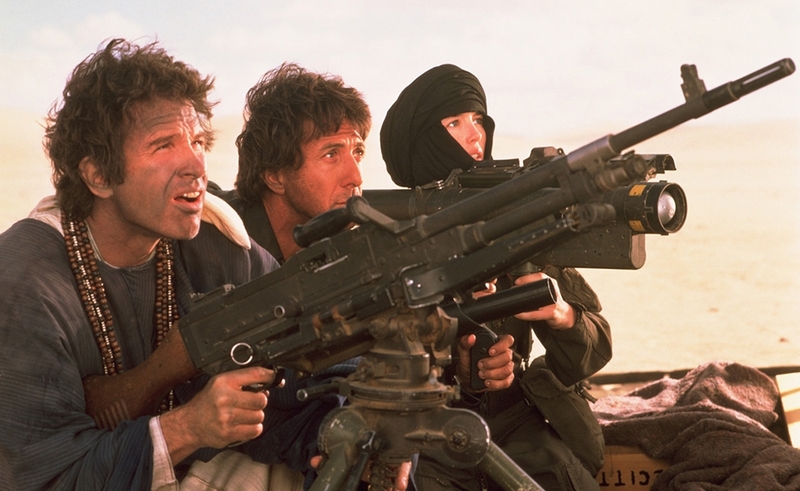 If Ishtar has a personal stamp, it’s not in what it has to say about Reagan-era militarism, but in what it has to say about collaboration, and how well-meaning people can goose each other to greatness—and folly. Given how notorious Ishtar is, and how many stories have been told about its troubled production—followed in recent years by the critical re-evaluation—it’s too bad Columbia/Sony didn’t release a proper special edition, with a commentary track and featurettes. (Even if May, Hoffman, and Beatty weren’t up for talking about the movie, plenty of film historians would have a lot to say.) Still, this Blu-ray is the first official Stateside appearance of Ishtar in any digital format, and it’s billed as the “director’s cut” to boot—though without any May interview or commentary, there’s no way of knowing what makes this version of Ishtar different from the one that bombed 25 years ago.